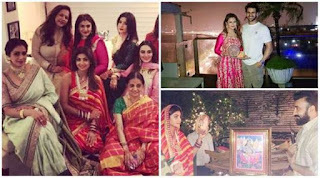 1.......Sridevi, Raveena Tandon, Shilpa Shetty and many ladies from the Kapoor family were seen all dressed up at Anil Kapoor's house to celebrate the auspicious Karva (Karwa) Chauth. There are many pictures shared by the celebs on their social media accounts giving us a sneak peek into how they opened their day-long fast and we see their loving husbands all by their side too. 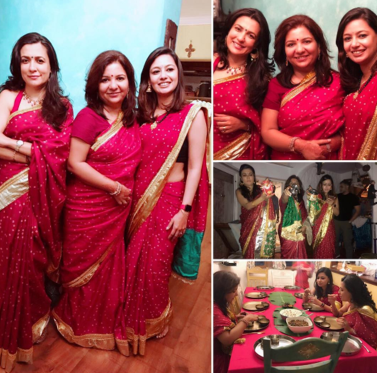 TVbahus Divyanka Tripathi Dahiya to Kishwer M Rai or Kishwer Merchant too shared their look from the day. Scroll on. 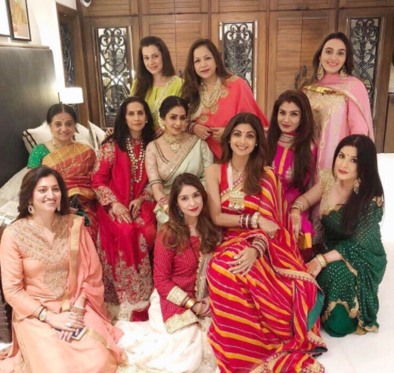 2........We were happy to see a frame full of ladies including Shilpa Shetty, Raveena Tandon, Sunita Kapoor, Maheep Kapoor and many others. 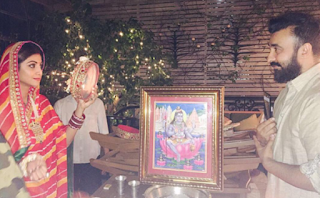 4..........Shilpa Shetty too shared this picture and captioned it as, "Awwwww @rajkundra9 , you are my “universe”😍Saw the pic of the moon in Amritsar (someone sent on the phone) This was a good idea considering no one in Mumbai could see it😓😰#karvachauth #memories #tradition #love #gratitude." 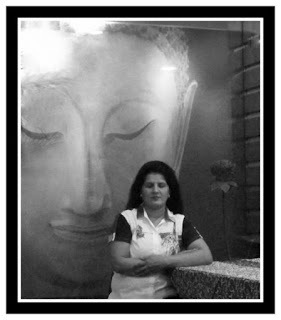 5................And Mini Mathur too shared her opinion about the fast. "Yes KC is a regressive concept. 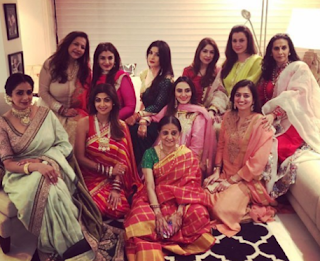 That women should fast for their husbands wellbeing without a reciprocal gesture is galling.. but there's something quite beautiful about keeping family tradition alive in today's world & the fun with which we mathur girls do it. I keep it mostly to keep my mom reassured that I'm still a good, honest wife and Basically think of it as a detox. It has my ma in law scurrying around me with great concern all day explaining why I should not follow customs that affect my health and jazz like that. Come evening, all of us wear our identical kayastha "Chunris" and meet for the pooja.. where we scoff at the story behind the festival (but we go through all the rituals anyway), laugh a lot.. tell the husbands they are not up to the mark, exclaim at the loudness of our sarees and tuck into a mathur feast. All in all.. I love the festivity more than the cause at hand. And yeah.. the husband lives 👨🏻🤞🏼#karvachauth #mathur #tradition," posted Mini. 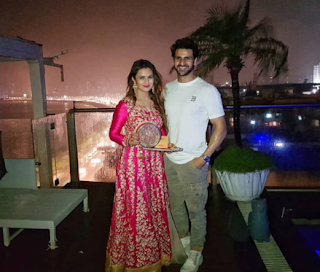 6.........TV's favourite couple Divyanka and Vivek Dahiya also celebrated the day. Vivek shared this post with caption, "With my moon by my side, the sky was full of rain and thunder. And so the fast finally had to be ended with the moon from the internet! #HappyKarwaChauth."